Updated December 2012: Pinterest released a meta tag verification option! I've updated the Blogger and Tumblr sections of this post to reflect that change. The Wordpress.com instructions have not changed. Oh Pinterest, you sure do keep bloggers busy! 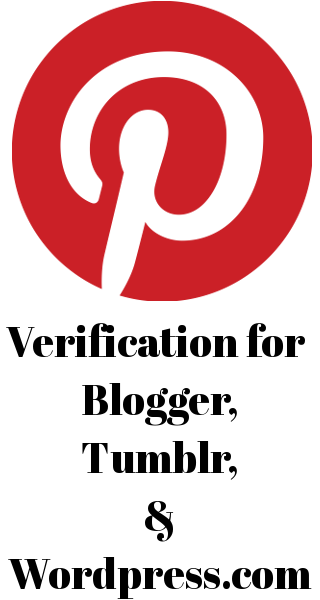 In late October, Pinterest introduced a new domain verification feature. When you verify your domain with Pinterest, you get a red & white checkmark next to your URL in your Pinterest profile. This is nice because it helps your fans make sure they're following the right account. But, since the verification instructions ask you to upload an HTML file, you may be wondering how you're supposed to verify your blog if you're on Blogger, Tumblr, or Wordpress.com. Thanks to the ingenuity of some very clever bloggers, there are workarounds, and I've rounded them up for you here! Update! You can now verify your Blogger blog using a meta tag. It's quicker and easier than uploading the HTML file. There's an excellent tutorial at Scattered Thoughts of a Crafty Mom. If you want to try it the hard way, I used this tutorial from TopTrix to verify Code it Pretty on Pinterest, and it worked. See! Update! Tumblr users can now use the meta tag option, too! To add a meta tag to your Tumblr blog, go to Customize > Edit HTML, and enter the unique meta tag Pinterest gives you at the end of the list of <meta> tags in your blog's code. If you'd like to try the HTML file upload option instead, a helpful gentleman named Francois Mathieu shared the steps to verify a Tumblr blog in his comment on the Pinterest blog. I followed his instructions and they worked for my Tumblr blog. Pinterest recommends this tutorial from Generate More for verifying Wordpress.com blogs. I have not personally tested it, but since the recommendation comes directly from Pinterest I think we can assume it's legit.